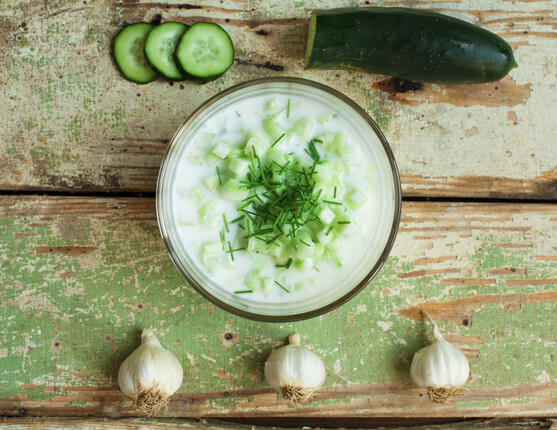 Tzatziki Sauce :: Edible Garden Corp. Description: Tzatziki is a wonderful way to use Edible Garden living dill. This sauce makes a unique dip on party platters with pita and fresh crudite. Or serve this light and refreshing sauce over grilled kabobs of veggies, lamb or chicken. Tzatziki is a wonderful way to use Edible Garden living dill. This sauce makes a unique dip on party platters with pita and fresh crudite. Or serve this light and refreshing sauce over grilled kabobs of veggies, lamb or chicken. Peel the cucumber and shred using a cheese grater. Mix all ingredients together until thoroughly combined. TIP: This sauce tastes best if you make it a few hours ahead of time allowing the flavors to brighten in the refrigerator before serving.